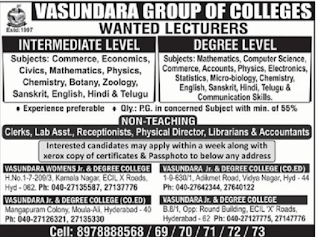 Vasundara Group of Colleges, Hyderabad has advertised in Eenadu newspaper for recruitment of Teaching / Non Teaching faculty jobs vacancies. Interested and eligible job aspirants are requested to apply with in a week.Check out further more details below. 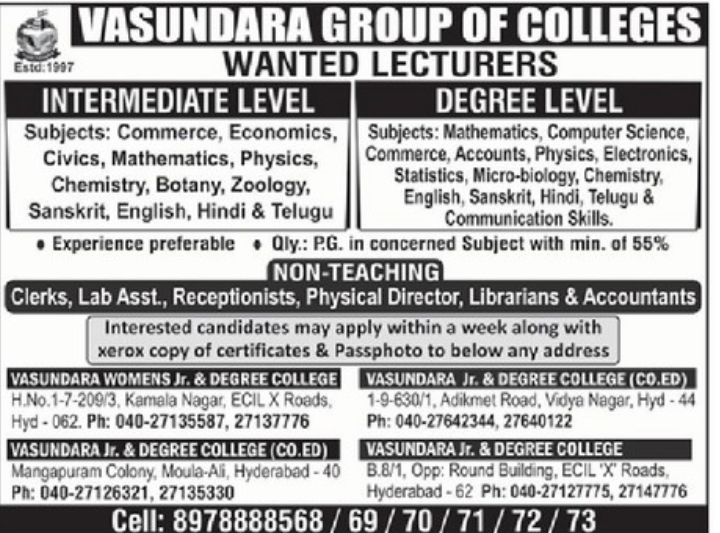 Name of the College : Vasundara Group of Colleges, Hyderabad. About College: Vasundara is committed to high standards of academic excellence. We here, constantly strive to enable students to traverse through learning, achieve success and go beyond their success to become lifelong learners such that adversities transform into opportunities for excellence. The importance of education in the life of an individual cannot be overstated. It not only shapes the individuals but also imbues them with values that govern all their choices in life. I believe in Nelson Mandela’s words “Education is the most powerful weapon to change the world”. With best wishes to all Vasundarites. PG in concerned subjects with minimum of 55%. How to Apply: Interested candidates may apply with in a week along with Xerox copy of certificates and passport size photo with below address. Last Date: Apply with in 7 days. Reference: Advertisement on Eenadu newspaper Dated 06th April 2018.